Right Positive upgraded 3/0 battery to starter cable for improved Cold Weather/Hard Start performance. Battery to the starter with 21 lead. 56″ with a 90-degree lug. 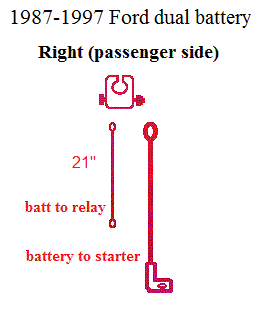 Reverse cable if using Denso starter. Military style battery terminal with a lock nut. Loom and cover optional. See bottom of the page. Because of larger wire, some minor fitting of starter lug may be necessary.